Now, back to the regular weekly Friday feature sponsored by Stacy Fischer of Visual Venturing, a forum open to anyone with an interest in exchanging ideas and experiences about post-processing, sometimes called the “digital darkroom.” The submissions are often surprising, and always interesting. For those who would like to participate, check Stacy’s site for the guidelines here. As most people living in the Mid-Atlantic and Northeast regions of the United States already know, the past several weeks have brought us more than our fair share of winter weather. 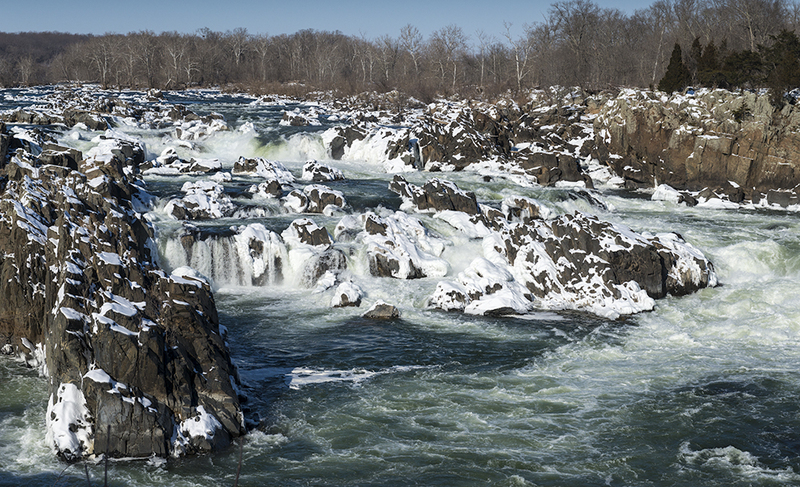 A week ago, the Washington, DC area set a new record low temperature, so what better time to see if Great Falls of the Potomac might be frozen solid. Short answer: No, not really close. But I took a few shots anyway. 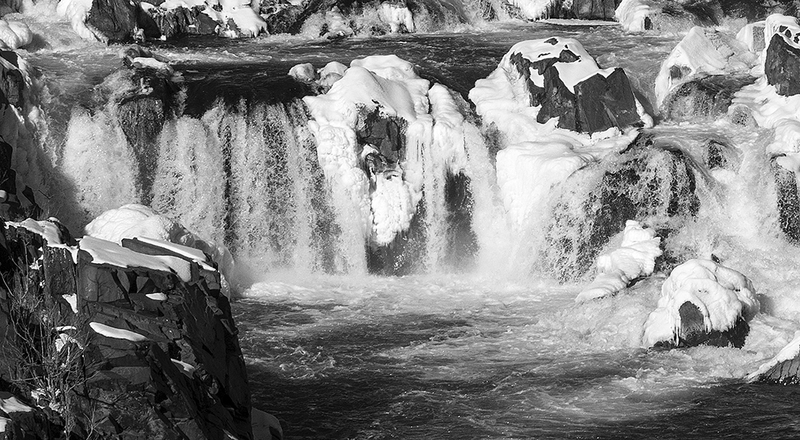 The image was then opened in Photoshop CC and it seemed that a Black and White version might be the best way to go. I used a Black and White Adjustment Layer (Blend mode=Normal) and selected the High Contrast Red Filter preset (which imitates the effect of shooting B&W with a red filter). This was followed with a Curves Adjustment layer (Blend Mode=luminosity) and using the Linear Contrast preset (which adds just a slight increase in contrast). 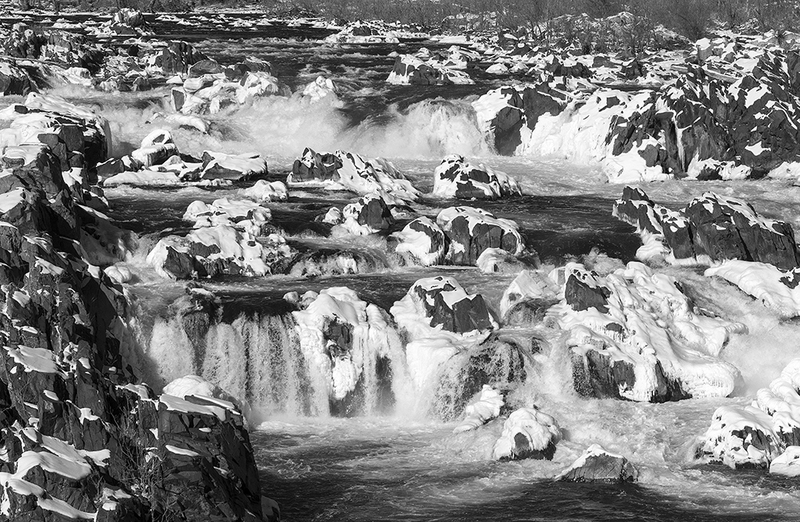 As a final step, I made a fairly substantial crop to highlight a specific section of the falls. The final result is shown below. Please check out the other submissions to this week’s ABFriday Forum here. And don’t forget the OnePhoto Focus next week in its usual schedule on the first Friday of each month. Everyone gets to try their hand on an image submitted by one photographer. P.S. In response to LensAdiction’s suggestion, the image below with a different crop is submitted for discussion. 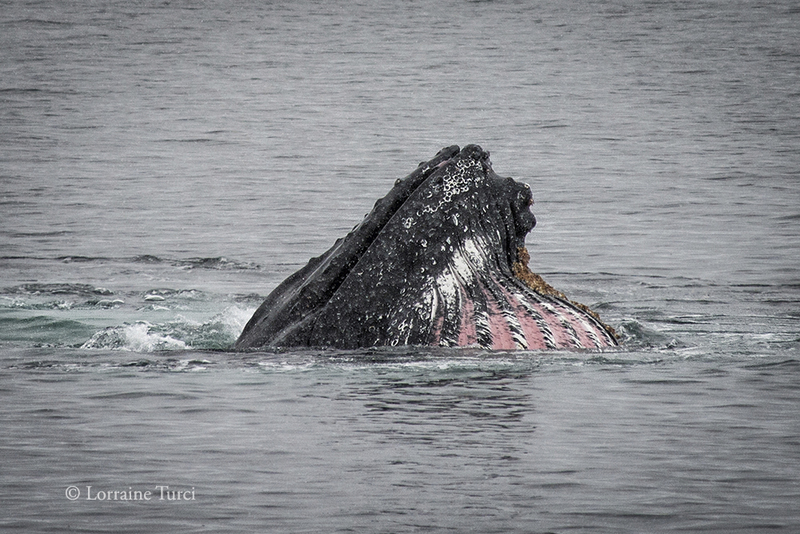 On the way, a new group of feeding Humpback whales was spotted and the ship maneuvered for a closer look. At this point I would like to introduce Lorraine Turci, the ship’s official photographer who used her 400mm telephoto to good effect. (See image above.) She kindly gave me permission to use some of her images on my blog. One of the more fascinating habit of whale and dolphins is their practice of creating a “curtain” of air bubbles when they are hunting. The curtain is often used to corral their prey and we all got a rare opportunity to see this in action. Lorraine’s image below was far better than mine and gives a great perspective on the complexity of these bubble curtains. Here she used a wide angle (24mm) lens which tells you that this happened right next to the ship. If you look carefully, you can see that a snow flurry came through at this moment. 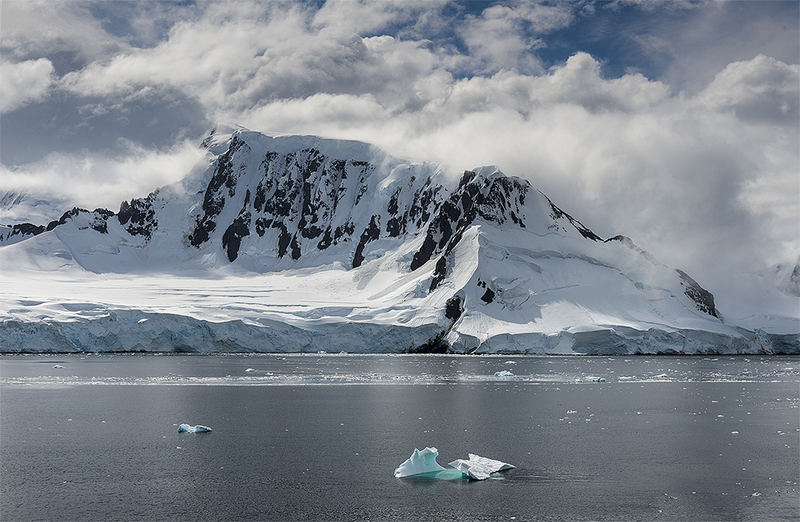 The skies seemed to be opening as we approached the Neumayer Channel (Image below). Prospects for a ride in the Zodiacs seemed good. 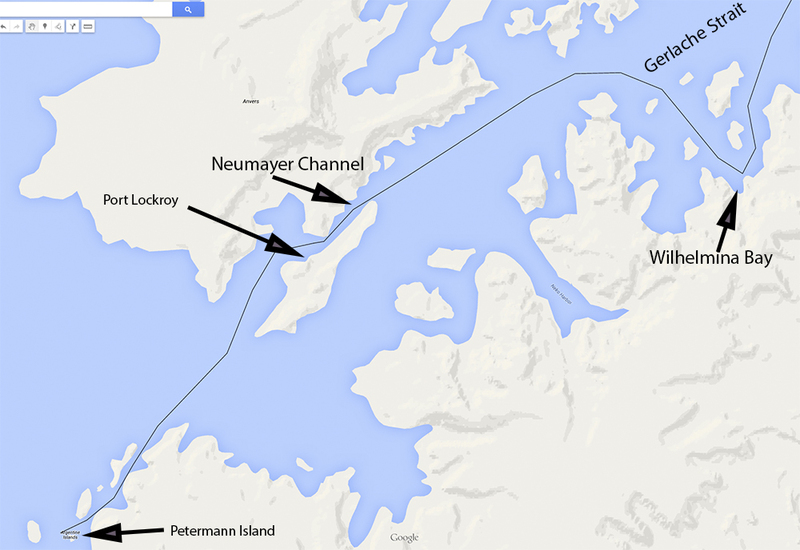 Port Lockroy, our destination, is a natural harbor that was used as a whaling station between 1911 and 1931. During World War II the British established a military presence on a tiny island in the harbor, calling the activity Operation Tabarin. Explanations vary as to the actual purpose, so feel free to launch your own Google investigation. 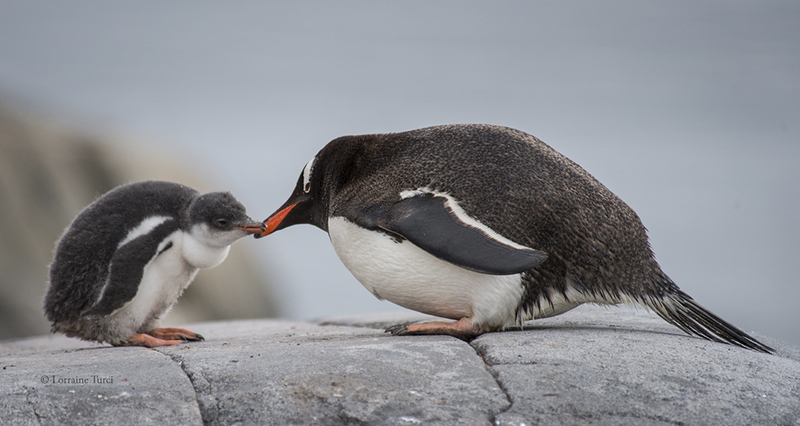 Designated a historic site, the base was renovated in 1996, and now serves as a post office, museum, and gift shop whose proceeds are used to fund the upkeep of the site and other historic sites in Antarctica. Although the practice of sending postcards has become uncommon these days, that word has not reached Port Lockroy. It seemed nearly everyone on the ship wanted to send a few and we were no exception. And never mind that delivery is unlikely to occur anytime soon. 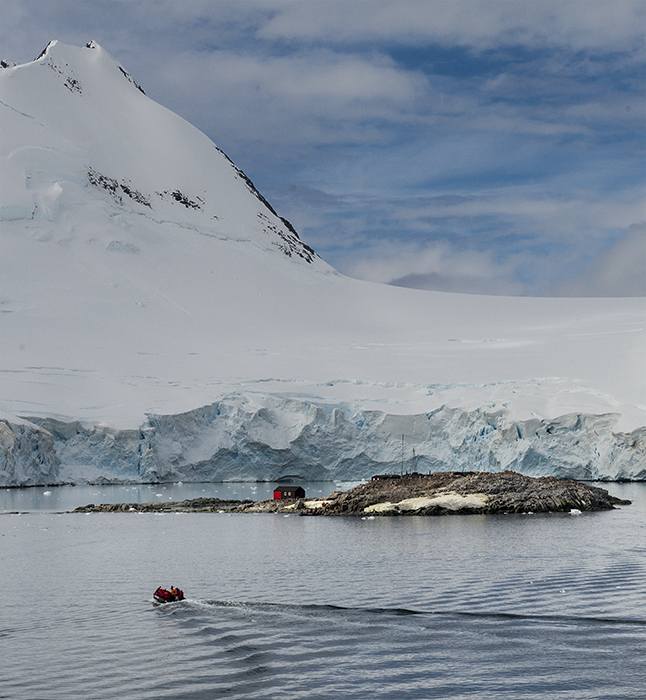 Conditions were perfect for our first Zodiac launch and we bundled up in our red polar coats and waterproof boots. The process of getting lots of people onto these lightweight boats was like a military operation, but a detailed description can wait for now. We were here to see penguins and mail postcards and buy souvenirs and take pictures. 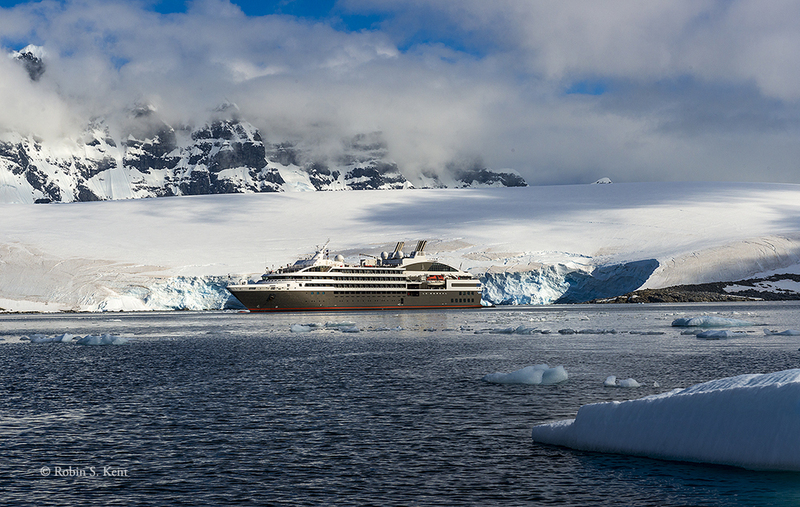 As we boarded the ship that would take us to the White Continent, I recalled our months of planning and preparation, the helpful advice from others who had preceded us, the sage equipment and technical guidance from experienced photographers/bloggers, and the detailed packing lists from the travel company. (See for example, my guest post on Leanne Cole’s Blog on December 5, 2014.) But now, looking at the grey skies over the Beagle Channel, we knew that good images depended almost entirely on the region’s infamously volatile weather. 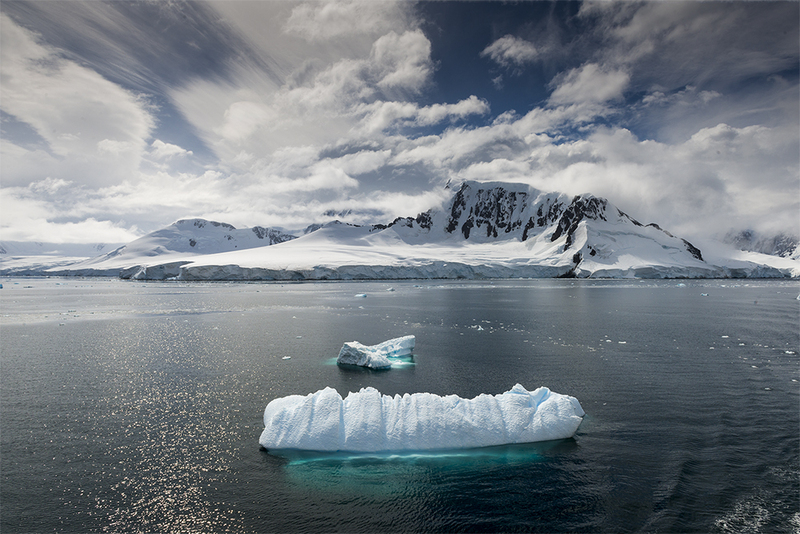 It takes two days on a cruise ship to cover the distance from Ushuaia to the Antarctic Zone, a voyage that often features very rough seas. But perhaps our luck was changing. 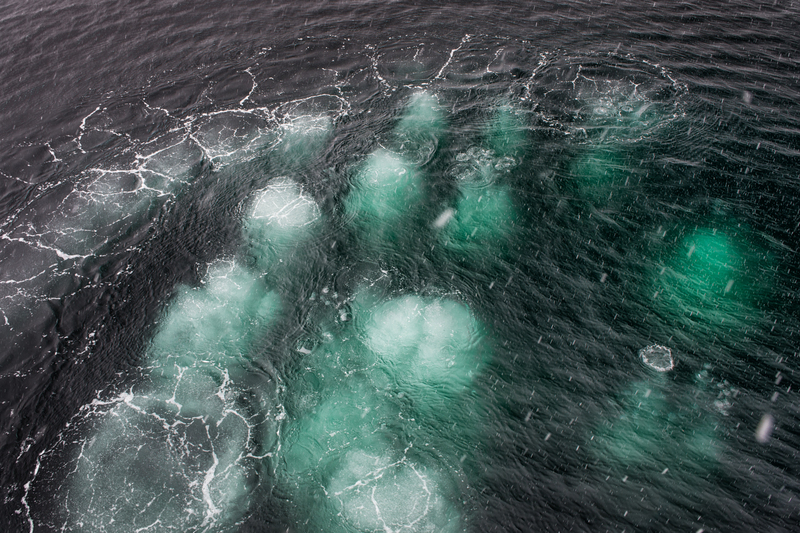 The Drake Passage which had brought grief to so many, seemed not to care about us. 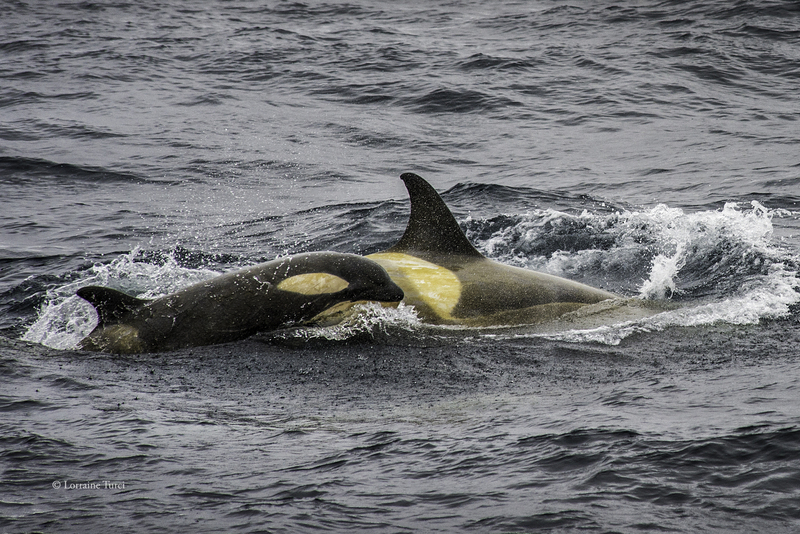 Nevertheless, after nearly 48 hours of remarkably smooth sailing, we reached the passage between the South Shetland Islands and found unpromising conditions. A heavy fog obscured the channel and the islands were almost invisible. Not good, I thought, as my camera remained poised but inactive. 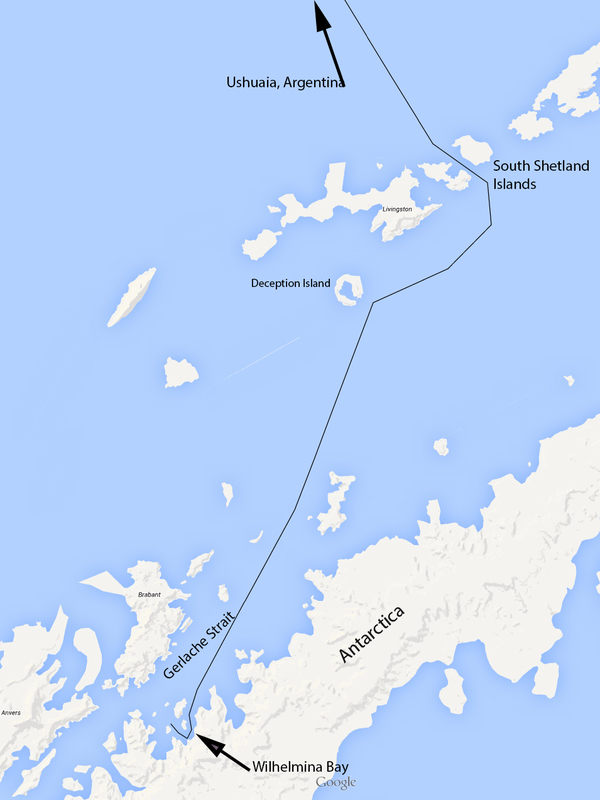 The ship’s captain decided to bypass Deception Island, one of the advertised highlight spots for a Zodiac landing. 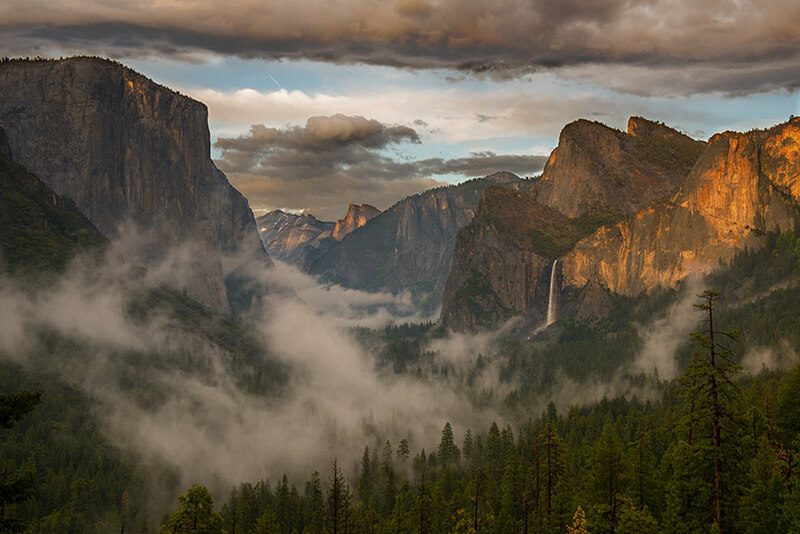 As we traveled south, however, the fog began to lift and about three hours later the scene began to transform (see image below). Shortly afterwards,the clouds descended again and snow flurries began to envelop the ship. But as I looked over the railing, the telltale sign of the explosive exhalations of humpback whales appeared, and the ship altered course to get closer (see image below). 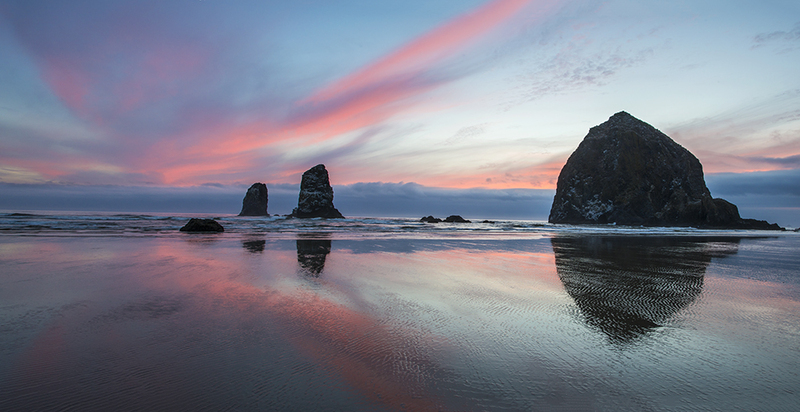 The image above is uncropped, full frame. 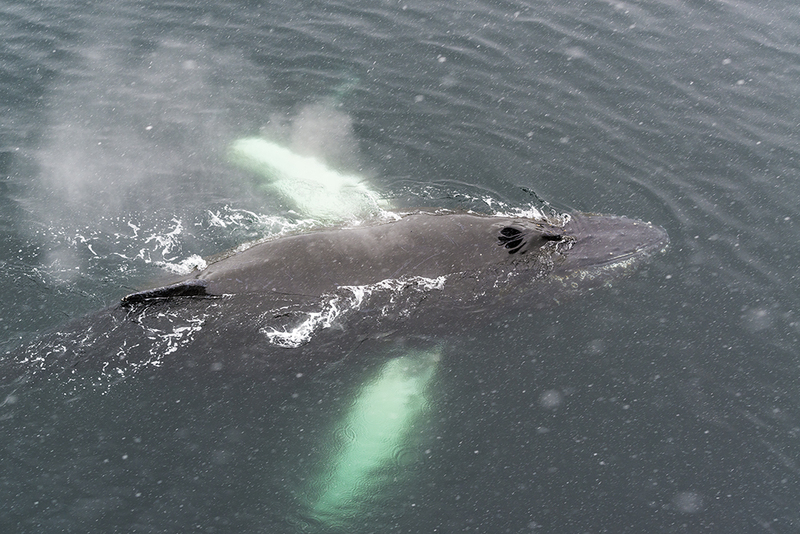 The whale was essentially next to the ship’s hull but was unconcerned by our presence. It became quickly apparent that the combination of low light and the ship’s motion would force some compromises on exposure choices. Normally I would have preferred a lower ISO and smaller aperture to ensure a sharp image. This would become a recurring theme in the journey. 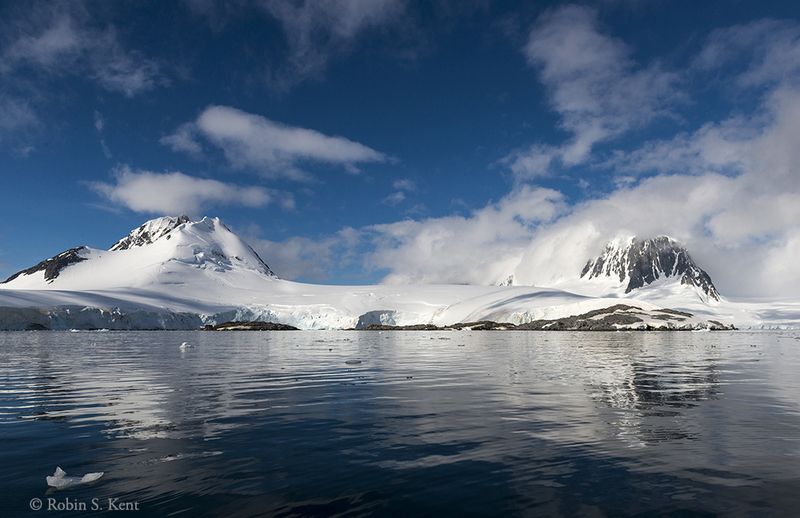 Less than 4 hours after the encounter with the whales, we arrived in Wilhelmina Bay and were treated to a spectacular combination of clear air and dramatic clouds punctuated by segments of blue sky (see images below). So far, so good. A smooth sail across the Drake Passage, it was still early on our first day, and at least a few decent images had already been captured. 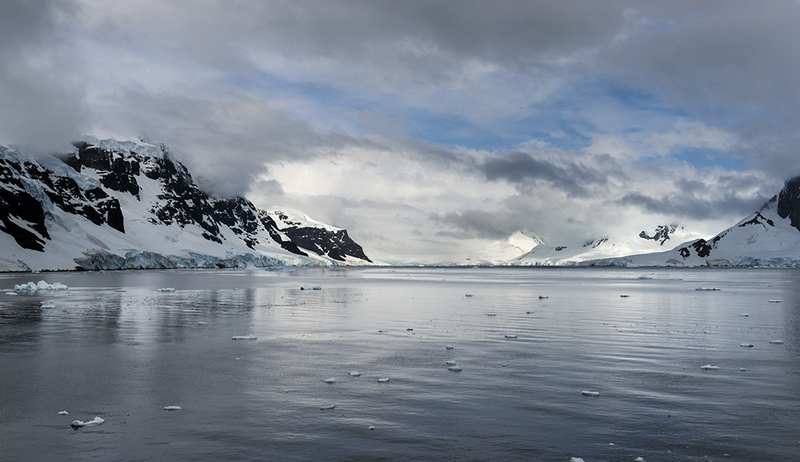 The next stop was Port Lockroy and, if the conditions permitted, our first Zodiac landing. Since my last post on 26 January, I have been traveling without benefit of Internet connectivity. Our principal destination was Antarctica but there also were brief stops in Argentina and Brazil. But now I’m back and this is the first of several posts describing what happened. After a harrowing pair of flights (snowstorm, flight cancellations, etc. ), we arrived more or less on time and unscathed in Buenos Aires. The fate of our luggage was another matter, apparently missing the connection from Miami. But I had my camera gear in my carry-on pack and the view across the street from our hotel was inviting (see image above). Our short stay made it difficult to see many sights in the city, but a few forays were made between periodic investigations on the status of our baggage. It turned out that the immediate neighborhood featured several touchstones of the city’s former glory, troubled political history, and present economic troubles. 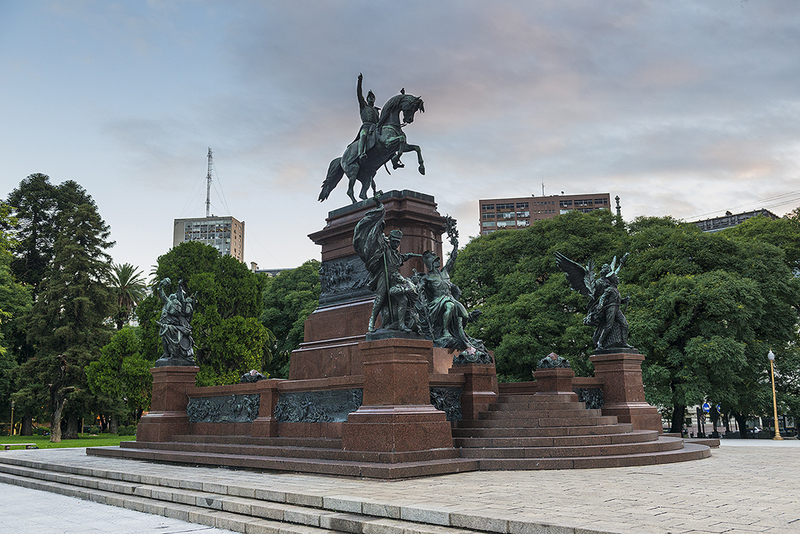 The park across the street is part of the Plaza San Martin named after the 19th century military leader who led the fight for Argentina’s independence from Spain. A massive equestrian statue in his honor dominates the southwest entrance plaza to the park (image above). A less positive event is memorialized nearby. The Monument to the Fallen in Malvinas honors the Argentines killed in the 1982 war with Great Britain over the Malvinas Islands (called the Falklands in England). The former home of one of the most powerful families of 20th century Argentina is directly across the street from Plaza San Martin. Now known as the Circulo Militar, it originally was the opulent residence of the Paz family, owners of then influential newspaper, La Prensa. Today it is a historical museum, but tours were not available while we were in the city. A walk down nearby Avenida Florida takes one past numerous tourist traps and the ubiquitous “Cambio” hawkers enticing passersby with offers of bodacious exchange rates, a reminder of the country’s enduring economic problems. Nostalgic reminders of the city’s glory days in the late 19th and early 20th centuries are also here such as the now empty Harrod’s Department store, the first and only foreign venture by London’s famed shopping establishment. Originally established in 1914, it was known as the gathering place for the city’s elite in the decadent tea salon and the place to buy Italian suits, expensive perfume and imported jewelry. 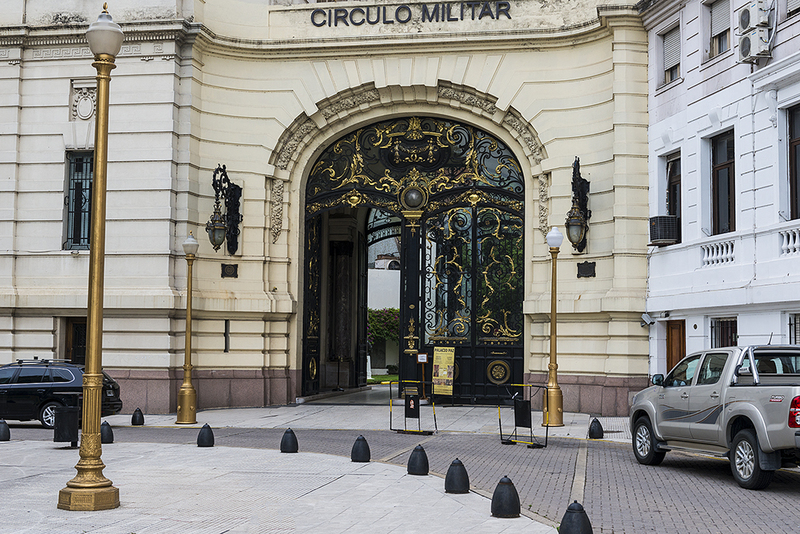 A few hundred feet away is the intimidating entrance to the Centro Naval (image above), an ornate beaux art structure also built in 1914 as the home of the Argentine Navy’s sports and cultural club. 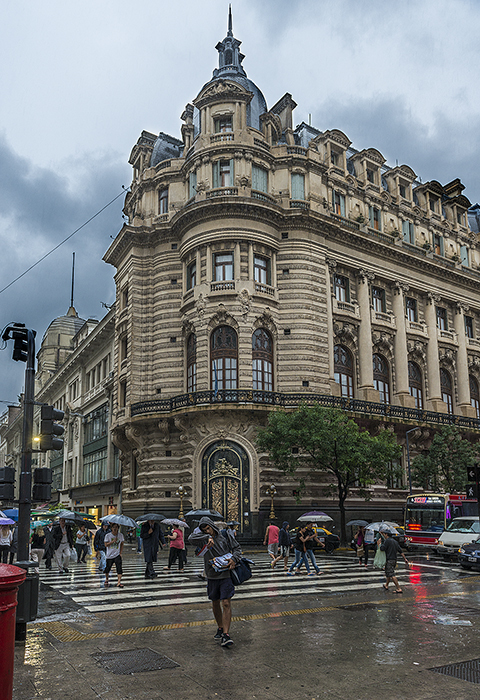 The majestic building and the club’s exclusivity reflect the important place the Argentine navy has historically held. Unless you are a member, don’t bother trying to get in. Another magnificent building is right across the street. The Galerias Pacifico was built in the 1890s as a high end department store. Since then, it has undergone a decidedly mixed history of transformations that included tenants of the National Museum of Fine Arts, a luxury hotel, and offices of the Buenos Aires and Pacific Railway. 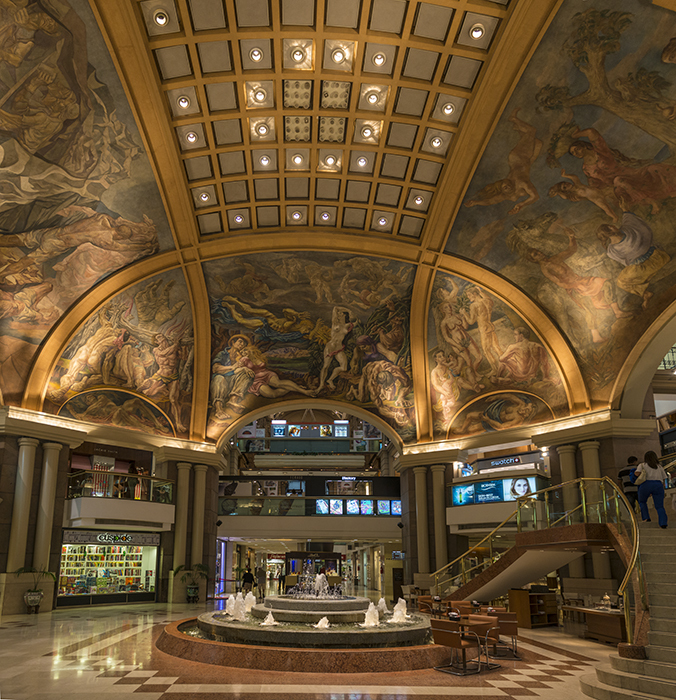 In 1947, five of Argentina’s top artists painted ceiling murals (see image above) which are considered national treasures. The building also has a darker side; in the mid-1970s, its basements were used as torture chambers for political prisoners. Today, it evokes its original purpose as an upscale shopping mall. 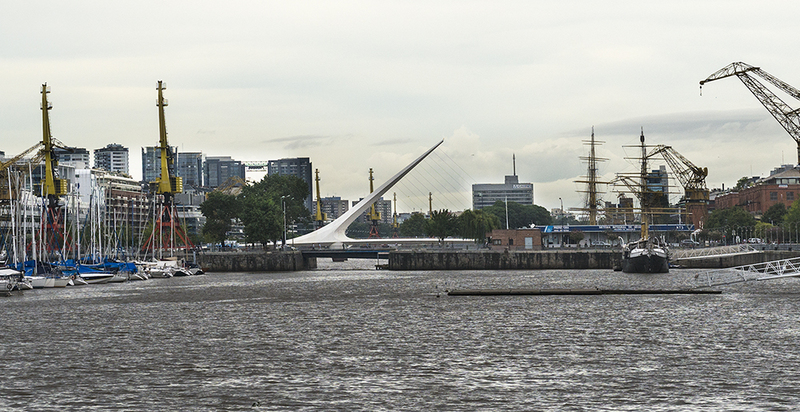 A 15-minute walk from the Galerias Pacifico will take you to Puerto Madero, a shipping port constructed in the 1890s that became obsolete ten years later because it was too small for newer, larger ships (see image above). For nearly a century, the area remained essentially unused until a massive revitalization effort was launched , transforming the old warehouses into elegant apartments, offices, hotels, cinemas, and restaurants (including the top rated Cabana las Lilas which we had intended to try but the airlines’ holding all our decent clothing hostage made that inadvisable). Every street in Puerto Madero is named after a woman, highlighted by the Puente de la Mujer, a pedestrian bridge by the architect Santiago Calatrava (see image below). Unfortunately, our time in Buenos Aires was too short and we had a plane to catch, a 4-hour flight to Ushuaia, Argentina, the southernmost city in South America and the embarkation port for our voyage to the White Continent. Our missing luggage had arrived at our hotel just in time and we were hoping that our bad travel luck was behind us……..